Finance Minister Steinitz and PA Prime Minister Fayyad agree on arrangements regarding taxation and the transfer of goods. 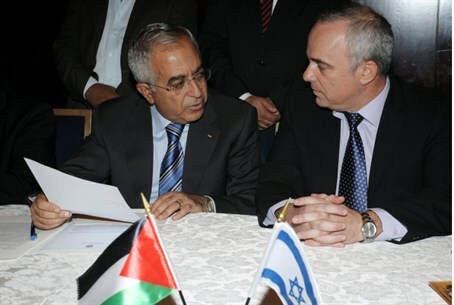 Finance Minister Yuval Steinitz and Palestinian Authority Prime Minister Salam Fayyad agreed on Tuesday on arrangements regarding taxation and the transfer of goods between Israel and the PA. The purpose of the arrangements is to deepen the trade between Israel and the PA and help both sides combat smuggling and tax evasion. The arrangements also will improve the PA’s tax system infrastructure, thereby increasing the scope of its income and will help its economic stability. According to the arrangements, tax accounting between the parties with respect to VAT, sales tax and customs, will be based on the actual passage of goods between Israel and the PA and not only on the basis of reports, as was the case until now. In order to do this, the tax authorities of both parties will increase the exchange of information between them about the transfer of goods. As well, advanced technologies will be used, special storage facilities will be established within the PA, and movement of goods will be channeled to defined crossings. This will be done in order to streamline the movement of goods and improve surveillance. In addition, a dedicated pipeline that will enable safe transfer of fuel exclusively from Israel to the PA will be established. The implementation of the arrangements will commence on January 1, 2013, and will be accompanied by a team of experts from both sides. The agreement comes as the PA government faces its worst financial crisis since its 1994 establishment. The PA’s labor minister recently warned that a shortfall in the delivery of aid from Arab donor nations means the PA will be unable to pay employees their July salaries or pay off debts it owes to private businesses. Fayyad warned several months ago that the Palestinian Authority may soon fail financially and cease to exist. A World Bank report last week said that the economic growth in the PA is unsustainable because of its heavy reliance on foreign aid. The report said the PA had begun establishing institutions for a future state, but the economy was not strong enough to support it. Saudi Arabia recently gave the PA an emergency $100 million donation. The money was given after PA Chairman Mahmoud Abbas had asked King Abdullah for emergency financial assistance for his government. In early July, the International Monetary Fund (IMF) denied a PA request for a $100 million bridging loan via Israel. Fayyad approached Bank of Israel Governor Stanley Fischer in search of Israeli assistance with obtaining the loan earlier this year. Fischer applied for the loan intending to forward the money to the PA, who would, in turn, repay the debt directly to the IMF. However, the IMF rejected Fischer's request on the PA's behalf, saying it did not want to set a problematic precedent for loans by proxy, due to the PA's near insolvency.